100th Post on Flecks of Lex! Well, folks, this marks my 100th post on Flecks of Lex. Woohoo! 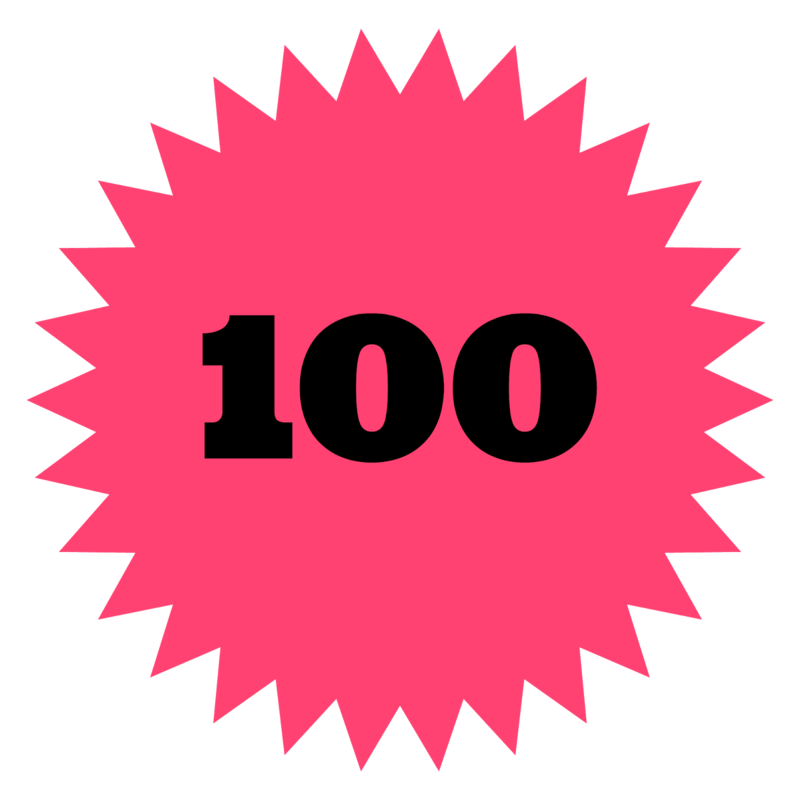 A hundred thank yous to all of my regular readers, as well as everyone who is reading Flecks of Lex for the first time. THANK YOU! I'm still in my first year as a fitness/health/lifestyle/whatever-you-want-to-call-it blogger, but I'm pretty proud of how far I've come in such a short period of time. Since I'm publicly tracking my progress, it has really helped me along my journey. I've been taking swimming classes, I tried out for a professional volleyball team, I've dropped a clothing size, and I even ran my longest race. Thank you for keeping me motivated! Run a 10K. I ran a 4-mile race earlier this month, so I think I should be ready to sign up and run a 10K in the next month or so. I had plenty of energy at the end of my last race (I did my swim class a couple of hours after the race, and even worked on my feet for five straight hours that evening), so I know I can run two extra miles. The search is on for a good 10K! I would love to hear your suggestions! Try out for the pro volleyball team in my region (again!). I didn't make it last time, and obviously there's no guarantee that I'll make it this time, but I still want to try again. I feel like I can give more, and I'm in even better shape now than when I tried out a couple months back. Join a running group. Yes, I play volleyball, A LOT. But an interesting thing that most non-volleyball players don't know is that your average volleyball player doesn't really like running. (I mean, I don't think most people in general do, but maybe I'm wrong. )Volleyball is a team sport, and running is generally done as an individual. They require completely different skills, so they're just really, really different. Most of my teammates are not interested in running, and those who are don't live terribly close to me. Only one of my housemates is interested in running, but he's moving out in a week, so that's no help. So how do I solve the problem of not having someone to join me on runs? I'm going to join a running group! The Silver Spring City Sports has two running groups that meet there during the week. I've heard that there are others in the area as well, I just need to identify them and build up the courage to go run with a group of strangers. Participate in an outdoor workout. I keep seeing different event invitations for free workouts in D.C., but I never get to go! They always look like so much fun. I'm going to try to make this happen before summer's end. Make more blogger friends! I've finally built up a little courage to start networking with other bloggers without feeling like a weirdo. It would be great to meet more fitness bloggers out there! I know there are a bunch in this area, but I've never actually met anyone in person. Here's hoping! Put together an Instagram challenge for June. I started participating in Jill Conyers' Run This Year April Challenge last month -- until this happened. Since I didn't have access to Instagram for a while, I couldn't continue posting. I was so bummed! I'm in the brainstorming process right now for my own Instagram challenge, and I need to kick my planning up a notch by actually getting my ideas down on paper in electronic form. I have a few things I'm planning to give away, so stay tuned! Host a virtual 5K. I saw this on a few other blogs, and I think it's such a cool idea! It looks like quite a bit of planning goes into it, so I'm going to have to dedicate quite a bit of my free time into working on this goal, which I don't have much of these days. Hopefully work will slow down a little bit in July and August so that I won't have so many evening and weekend events, and I can work on planning the virtual 5K. Write more frequently! I think this is a common hope for bloggers. When you have a full-time job, it's often hard to carve out time to write once you finish all of the other things you have to do outside of work. Add to this the fact that, for some reason, I'm stuck on this idea that every post has to be long and meaningful to me; because of that, sometimes I go an entire week or more without a single post. Once I get over that, I'll be able to post more frequently. Thank you, again, for stopping by my little ol' blog. I really appreciate you! What are some things you would like to see on Flecks of Lex? What are some of your current goals? Do you have any exciting plans for the summer? P.S. Totally unrelated to this post, but I cannot get this song out of my head. I love it! Congrats on your 100th post!!! !